The 6-burner range (ie. 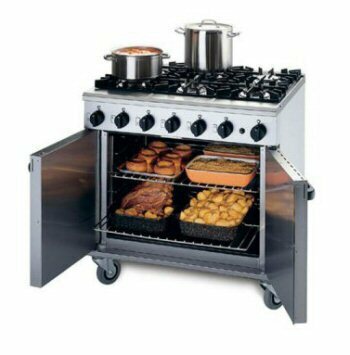 a convection oven with hob on top) is still the most popular cooker in medium to small British catering establishments. Even now, with all-singing-and-dancing steam combi-ovens on the market, the 6-burner range retains its place as the workhorse of the kitchen. Prices are kept low by competition among manufacturers and high production volumes. In fact in some cases the price of the 6-burner range is lower that that of its smaller 4-burner brother. Many other range configurations are available, including solid tops and drop-down door models. Blue Seal models include part griddle, part open burner versions. Other choices include natural gas, LPG, electric and dual-fuel models. Listed below are models from our two favourite manufacturers, Blue Seal and Lincat, however we can also offer large discounts on other makes.